The bladder is emptied through the urethra and urine is removed from the body. Of course, beyond those 5 steps there are elaborate layers of control. The picture on the right is a "snapshot" of the bladder during the urine storage phase. The text below explains the micturition process, and there is a more indepth animated graphic at the bottom of the page. We invite you to "interact" with it to explore some of the more complex issues that arise when a person has a spinal cord injury. The bladder is composed of bands of interlaced smooth muscle (detrusor). The innervation of the body of the bladder is different from that of the bladder neck. The body is rich in beta adrenergic receptors. These receptors are stimulated by the sympathetic component of the autonomic nervous system (ANS). Beta stimulation, via fibers of the hypogastric nerve, suppress contraction of the detrusor. Conversely, parasympathetic stimulation, by fibers in the pelvic nerve, cause the detrusor to contract. Sympathetic stimulation is predominant during bladder filling, and the parasympathetic causes emptying. Two sphincters control the bladder outlet. The internal sphincter is composed of smooth muscle like the detrusor and extends into the bladder neck. Like the detrusor, the internal sphincter is controlled by the ANS and is normally closed. The primary receptors in the bladder neck are alpha-adrenergic. Sympathetic stimulation of these alpha receptors, via fibers in the hypogastric nerve, contributes to urinary continence. The external sphincter is histologically different from the detrusor and internal sphincter. It is striated muscle. Like skeletal muscle, it's under voluntary control. It receives its innervation from the pudendal nerve, arising from the ventral horns of the sacral cord. 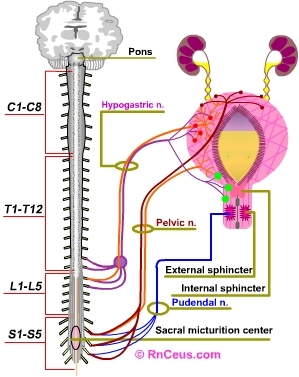 During micturition, supraspinal centers block stimulation by the hypogastric and pudendal nerves. This relaxes the internal and external sphincters and removes the sympathetic inhibition of the parasympathetic receptors. The result is unobstructed passage of urine when the detrusor contracts. The ureters pass between the layers of the detrusor and enter the bladder through the trigone. The ureters propel urine into the bladder. The bladder passively expands to accept urine. As the bladder expands and intravesicular pressure increases, the ureters are compressed between the layers of muscle, creating a valve mechanism. This valve mechanism limits the backflow of urine. Summary: Normally, we are able to control where and when we void. This is largely because the cerebrum is able to suppress the sacral micturition reflex. If the sacral reflex is unrestrained, parasympathetic stimulation via the pelvic nerve causes detrusor contraction. Detrusor contraction is suppressed by alpha and beta sympathetic stimulation via the hypogastric nerve. In response to afferent stimulation, the cerebrum becomes aware of the need to void. If it is appropriate, the cerebrum relaxes the external sphincter, blocks sympathetic inhibition, the bladder contracts and urine is expelled. Sympathetic stimulation inhibits detrusor contraction, while parasympathetic stimulation causes detrusor contraction. We become aware of the need to void when the bladder holds about 50 cc.